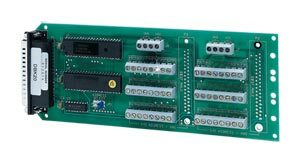 The OMB-DBK20 and OMB-DBK21 general-purpose digital I/O cards expand the number of digital I/O lines by forty-eight per card. The OMB-DBK20 and OMB-DBK21 connect to the digital O connectors on the OMB-LOGBOOK, OMB-DAQBOARD-2000 Series or OMB-DIGIBOOK-72 data acquisition systems. Please note that when either the OMB-DBK20 or OMB-DBK21 is connected, the OMB-LOGBOOK, OMB-DAQBOARD-2000 Series or OMB-DIGIBOOK-72 digital I/O lines do not function as digital I/O lines for user-connected digital signals. Thus, for example, the first OMB-DBK20 or OMB-DBK21 card attached increases the system’s number of usable digital O lines from twenty-four to forty-eight, and subsequent cards each add forty-eight additional lines of user-programmable digital I/O. Up to four OMB-DBK20 or OMB-DBK21 cards can be attached to the P2 port of a system, for a total of 192 lines. The OMB-DBK20 and OMB-DBK21 differ only in that the OMB-DBK20 features screw-terminals for signal outputs, whereas the OMB-DBK21 provides DB37 male connectors for signal outputs.